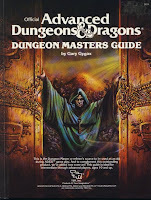 In the comments to yesterday's Gameblog post Hartful asks "What would you recommend must reads from old editions as a DM?" 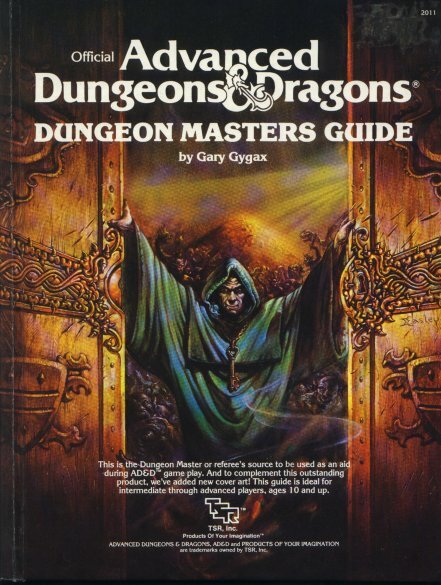 Like it says in the title, the first edition Dungeon Masters Guide is the first thing you ought to read. It's the only RPG book I read from cover-to-cover every two or three years. Not only is the classic Gygaxian prose in full effect, but it's just full of stuff that you can use in any fantasy game, not just D&D: random NPC personalities, gem types, herbs, random dungeon charts, siege engines, castleworks, government types, noble titles, gambling methods, crazy mofo artifacts, ships, potion ingredients, etc., etc. I have yet to run a fantasy campaign without opening this baby up at least once, no matter what rules I use. Comparing the 1st edition DMG to the lackluster 2nd edition version really shows the difference between a competent game designer and an actual ludo-genius like Gygax. 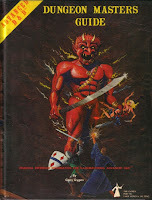 The DMG is the reason why I'm so excited about the forthcoming AD&D1 reprints from WotC. The Monster Manual is only so-so. If I had to pick a single 1st edition monster book to use for all future gaming this would rank 4th or 5th on the list with the Fiend Folio at the top. It's main value back in the day was basically "Holy crap! Look at all these monsters!" and "Wow! They do games in hardback now?!" The Players Handbook is good not great. Warts and all, the DMG is one of the best texts ever produced by the hobby. Even if you don't own the rest of the line and have no plan on playing AD&D, you need a DMG. The other TSR items I would definitely recommend for new DMs especially are the two early adventure modules B1: In Search of the Unknown and B2: The Keep on the Borderlands. Both have great advice and provide examples of what you can do in your games. Just don't assume they're the only way to play. Non-TSR items would be a whole nother post I think. Maybe tomorrow. I completely agree. The DMG really is timeless with regards to editions or systems. Which of those two DMG covers do you prefer, Jeff? I prefer the older cover. But no less than Gary Gygax preferred the later cover. i'm looking forward to hearing your opinions about the non TSR items. I picked up the DMG 1E a few years ago, but it's been a while since I've perused it. I should get back in the habit. I also picked up an old Rules Cyclopedia which also is a great comprehensive volume. Geoffrey: I dunno, man. The newer cover expresses a lot about DMing. It really fits the book. The old cover is just an awesome adventure. I read it for the first time a couple years back, and I'm in complete agreement with you about its value. I started roleplaying in 1984, but I never had an AD&D DMG until a few weeks ago. Parts of it are great. Other parts are... well, I have trouble imagining a game that needs such elaborate parasitic infection rules. Any pro tips on getting the most out of the book? I have trouble imagining a game that needs such elaborate parasitic infection rules. Then you, sir, have not played in my games. @Evan -- If I'm in the neighborhood, I'd be happy to sit in. I'll just recruit a hireling to carry extra water, extra wine, extra boots, and maybe some extra air. @gdbackus -- Thanks for the advice! As an old hand at RPG books, that's what I'm doing. Can you point to, say, 4 gems that I shouldn't overlook? 1. The preface; detailing the design framework that the game was built around. If only later custodians of the game really bought into the principles outlined here. 2. 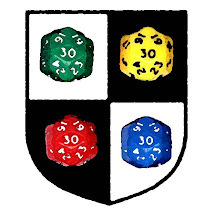 Generation of ability scores: AD&D was not intended to use 3d6 in order. You can always pick out people who assume the content of the DMG without having done more than skim it (if that) when/if they complain about AD&D's random tyranny of 3d6 in order. Gygax wanted people to have some choices after stat generation. 3. Time in the Campaign/Dungeon: AD&D doesn't work right without a certain level of resource management. Campaign time keeping does add a certain element of depth to the campaign as characters age and seasons pass. 4A. Encounter Distance: most encounters do not start within the 10' melee range. A lot of tactical opportunity and variation is lost when 90% of encounters are reduced to rolls for surprise followed by sword fighting. 4B. Morale: just as the beginning of encounters is not often understood as written, so often neither is the end. Many DMs have monsters fight too long and reduce combat to a mindless statistical grind. If your PCs understand what will make a monster break, tactics will not break down into the "I roll, I hit, I roll, I miss" that one often sees complaints of on various forums. I swear that the contents change slightly every time I open it. How could I have the same book for 30 years and keep finding new stuff in it? I think it'd be my "take to a desert island" volume. I'd spend the rest of my time there trying to carve dice out of rock. One of the guys who introduced me to D&D back in the early 90s had "acquired" a copy of the 1E DMG (original cover) from the town's public library, where we started our gaming. I used THE HELL out of that two-page chart of herbs and their applications. I'm looking forward to the WotC release of the 1E core books so I can own a copy legitimately--20 years after the fact! Was using the DMG(1st)[second cover] just before I took the break to write this. Working on Random Dungeon Generation with liberal creative editing; looks awesome! No argument here. The appendices alone are worth the price of admission. Random dungeons. Random wilderness terrain. Random encounters. Random generation of creatures from the lower planes. Random harlots. Tricks. Traps. Herbs. Appendix N. Did I mention the harlots? 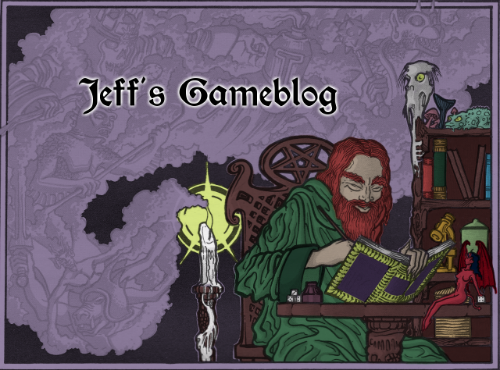 Jeff, you are so right about the *Fiend Folio*. What a great monster...uhm... "manual." I spent MANY Saturday afternoons pouring over it's pages. That tome and *Deities & Demigods* too. What a cool book, filled with great illos. Gygax's warning not to peek scared me away from it! Are there actual spoilers in there or am I just being silly? Maybe it'll be ok if I just steer clear of the crazy mofo artifact section? I'm DMing right now, but I haven't given up on being a PC! Don't forget the AD&D Dungeoneer's Survival Guide. It introduced isometric mapping, and non-weapon proficiencies (outside or oriental adventures). It's Dungeon Master's advice on Plot and Counter Plot and world design still directly effect how I craft and string together adventures. I actually liked the Monster Manual best out of the monster books, but maybe that's just because it was the only source of monsters I had at first. And because of Trampier. Trampier's art in that volume -- and in all others he contributed to -- is excellent; however, the Fiend Folio has Russ Nicholson. I came to Original D&D late, but the third volume "Wilderness and Underworld Adventures" is DM gold. It has nothing like the page count of the 1e DMG of course, but there is some great stuff in there. Using the tables (the castle inhabitants, wilderness and dungeon encounter charts especially) it has or modifying them for your game world is a really really efficient way to run a game. The DMG felt really dry to me. If you're talking older edition books that make your heart sing, what about the 2nd Edition AD&D Monstrous Manual? I loved that thing to death, and read it until my copy disintegrated in my hands. Definitely the 1e DMG has tons of great stuff for any type of gaming. It can be really hard to find the cool data, but whenever there's some esoteric question about how much a ballista costs, you go to it because it's probably in there somewhere. It's like they used to say about V. Gordon Childe in mid-20th century Old World archaeology, "It's in a footnote of 'The Dawn'", meaning his "Dawn of European Civilization". Total hodgepodge and hoard of data, and an expression of one person's genius, but not totally accessible. 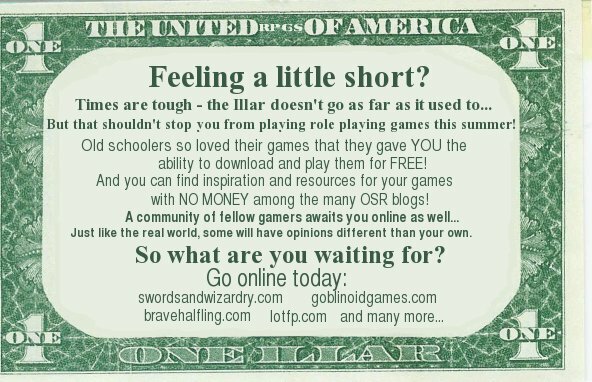 If you look at it like an anthology of blog posts on D&D instead of a linear narrative and use it like that then you can appreciate the awesomeness more readily. The second cover is about as perfect a cover for a DMG as you could hope for. It's mysterious, dark, and suggestive of secrets held by the DM alone. The first cover looks like a module/adventure or something. But yes, it is a treasure trove of a book. I particularly like the many lists and tables of "stuff" and the random dungeon generator, but immersing yourself in the Gygax text gives such a sense of what AD&D is, too. The 2nd edition DMG is nearly useless by comparison, and feels sterile/stripped-down. The original is the standard as far as how much useful information needs to be available for the DM in any "advanced" type DMG. Less than this and the author has skimped. Even if much of it goes unused, it is there should the player want it, and even reading through it will give a sense of the game beyond the potential for use in play. I just want to agree with Chris above (but not about the DMG), and say the Monstrous Manual was an inspirational book, too. The sheer amount of monsters collected in one book, plus the great art by Tony DiTerlizzi made me want to run a game whenever I looked through it. In fact, when a friend of mine first acquired it and I flipped through, I was inspired to start an impromptu campaign right then and there... that campaign lasted for a while, too. I'm going to pile on: The new cover is better artistically and better at expressing the character of the DM (well done, Jeff Easley! I hope all his fans have found him on Facebook.). The original cover is full of irreplaceable associations and memories no price can be put upon. I lost my original copy I got as a kid and had to replace it with a second cover version while in college. A year or so ago, I found an almost pristine copy of the original cover version at Half-Price Books. I bought it and gave my 2nd cover printing to my daughter SO fast, it made that creepy DM's head spin. However, if I was going to hang something on a wall, or pay for someone to design a cover for a DM book that I was writing, it would be Easley's. And yes, one of the, if not THE, most important books for a DM/GM to read, ever, in spite of its difficulties. Good call, as usual, Jeff R.
Why don't they redesign and reprint both covers? 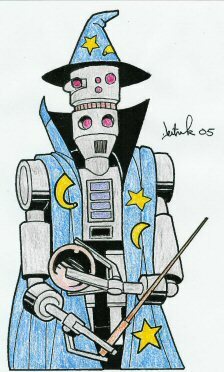 I'm too young to have any nostalgia for the original art so I'd prefer the 2nd version (or the first redrawn). I really want to tell WotC that the reprint is a good idea (with my money), but I might buy a used copy with the second cover instead. 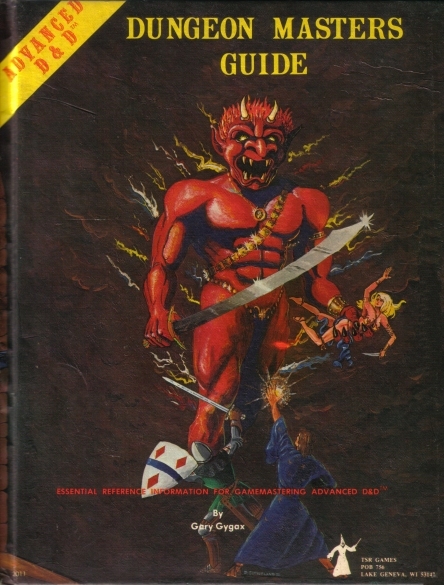 The 1st edition AD&D DMG is a must-read for fantasy gamers. I would argue, though, that it's not particularly well edited or well organized. You not only can read it over and over again and get something, you need to do so. But there are buried gems in there, and it'll really give you an idea of 1st edition gaming, and you can get a lot out of it. I still look through mine periodically, but mostly I'm surprised at how many tiny little rules are buried in there, down deep, and that I ever managed to play a semblance of the game when I was young. Funny... I have sold or given out for free all my TSR books, but I've kept the DMG, the PHB and the FF. I'm lucky enough to own both covers!AND the original Deities and Demigods! My Unearthed Arcana is falling apart though. I'll throw another vote in for the 2nd cover of the DMG. I started with the gfirst cover but I have no nostalgia for it. The second cover kicked all kinds of rump. Besides, it's what's INSIDE that's important. Also I'll sing the praises of the 1E DMG. I did most of my earlier gaming in 2E and am fond of that ruleset but the Gygax still inspires in the 1E DMG. Now I DM Basic and my ideal situation for a group would me the Rules Cyclopedia ruleset with a side of the Creature Catalog (either edition) and the 1E DMG for random things and inspiration. I could go a loooong way with that setup.